Our COBRA roadster decals have been specifically designed to fit the Aurora T-jet COBRA body. They allow the modeler to create 11 different historically accurate versions of this legendary race car. 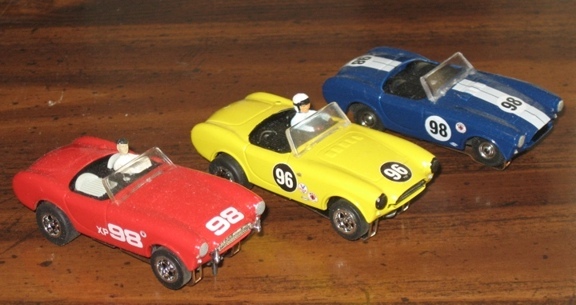 Although designed for the COBRA, this decal set is uasble on other slot cars as well. Go little Cobra! The name itself is magical. The recipe was purely American: Take a small, light British sports roadster, and cram a V8 down its throat.... During its short life, the COBRA won an impressive number of races, and is such a head turner that numerous reproductions have been made. 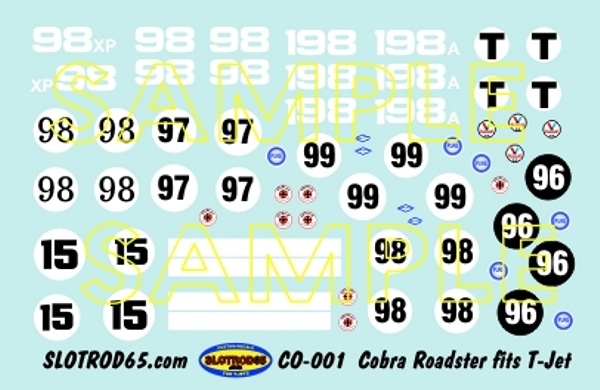 SLOTROD65's COBRA roadster decal set allows the modeler to build up to 11 different versions of the COBRA roadster from it's first races, to the full blown 429 livery. 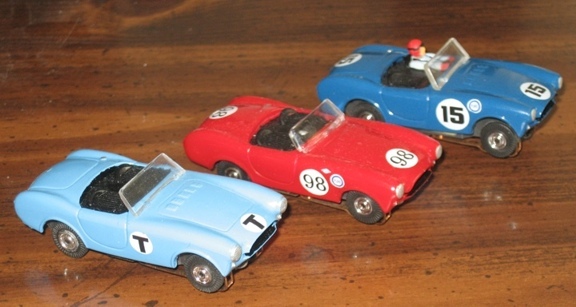 The set even includes decals for the light blue trainer cars that the COBRA racing school ran at Riverside. See below for a sample of the COBRA roadster decal set. Note that the actual decal is far sharper than the image below. If yoiu really love the COBRA, be sure to pick up a copy if Dave Friedman's book: SHELBY COBRA for good reading and many historical photos..
SLOTROD65 is a division of EXCELSIOR ROCKETRY. Interested in decals for model rockets? Try excelsiorrocketry.com !